Taking the Pub and Paddle Picnic Boat for a row is a great way to see Norwich from a completely different perspective! 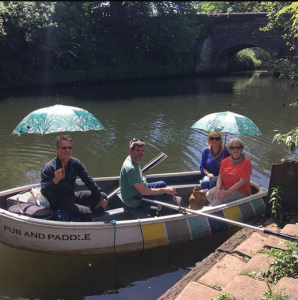 Please note this is not a canoe but a rowing boat – much bigger than our canoes and therefore perfect for enjoying a picnic in the boat and also for those of you who like a bigger, and therefore more stable :-), boat. Starting from the Red Lion pub on Bishopgate you row your way into the city – past Cow Tower, underneath the Jarrolds Bridge and Whitefriars Bridge, along Quayside and plenty more historic bridges and interesting places. You can choose whether you want to go out for 2 or 3 hours, and we have morning and afternoon start times! The Kingfisher boat can seat 4 adults or 2 adults + 3 young children, and the Sunrise boat can seat 3 adults or 2 adults + 2 small children. We have small tables that can go in the boats so perfect if you’d like to bring a picnic with you. 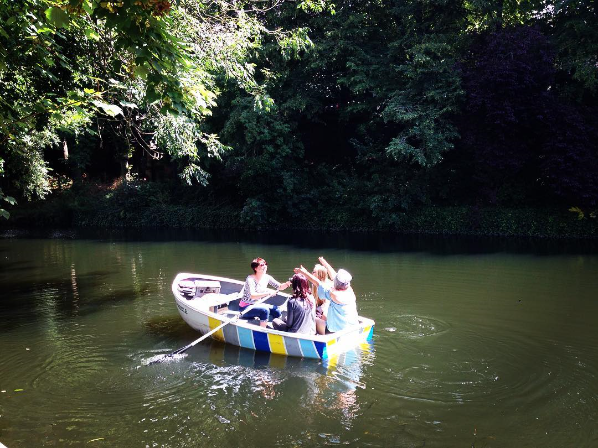 The Pub and Paddle Picnic Rowing Boat is a great activity for friends, families or a casual date!